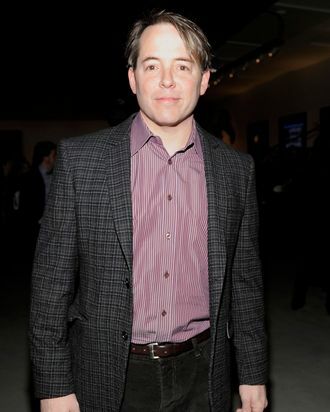 How does one convince Matthew Broderick to do a Ferris Bueller–themed Super Bowl ad? Patience. “It took a little, uh, thinking about it, it took a little time, but I ended up thinking it might be amusing,” Broderick told us last night at the Dewars-sponsored opening gala for the Signature Theater Company. “Todd Phillips was directing it, who’s a good director, and I thought it would be fun to send up Ferris Bueller a little bit,” Broderick says. The shoot took place over four days, which he says he spent “running around L.A. … thinking, ‘I hope this is a good idea.’” And now that it’s all done and out there, Broderick’s basking in the glow of being a viral hit. Well, sort of. “I guess I’m part of a virus,” he said.